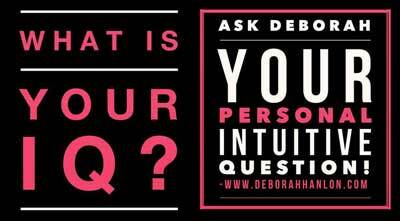 Deborah will take up to 30 minutes to “tune in” to your Intuitive Questions for yourself! Her response will be sent to you via email. Please note that this is NOT to be used as a form of Mediumship. If your question is about the deceased, it will not be answered and you will have to resubmit your Intuitive Question. $55 (per question) with a six (6) day turn around or $75 (per question) for a response within 72 hours. YOU WILL RECEIVE FULL INSTRUCTIONS ON HOW TO SUBMIT YOUR QUESTION(S) AFTER YOU REGISTER/PAY! You will be required to submit your question within (10) ten days of purchase.